February 6, 2019 -- With just three weeks to go, the global radiology community is readying itself for the 25th European Congress of Radiology in Vienna. The conference has gone from strength to strength, resulting in a five-day extravaganza of product releases and cutting-edge clinical research presentations, with an increasingly diverse and international feel. In keeping with this year's theme of "the bigger picture," here's a look at six of the hottest topics on the ECR 2019 exhibit floor and in the broader medical imaging arena today. There's no getting away from the fact artificial intelligence (AI) will dominate ECR 2019 this year. The radiology community is warming to the concept of AI use in diagnosis, seemingly getting over the initial fears of AI replacing radiologists. However, growing enthusiasm and anticipation of AI will only drive greater scrutiny of real-world clinical evidence and outcomes-based evidence to support use. Triage solutions that use automated detection to prioritize more urgent cases within the radiologist worklist will be prominent. This goes hand in hand with the broader trend toward edge computing in medical imaging, embedding greater processing power within scanners and enabling preanalysis of images ahead of a radiologist's primary interpretation. AI-based tools that provide automatic quantification of measurements are another front runner for adoption, tapping into two key themes of radiology today: efficiency of reading considering dwindling resources and the push for wider use of radiomics in diagnosis. However, adoption of quantification tools could be tempered by the rate at which health systems transition to structured reporting processes. As healthcare providers have grown, so too has the complexity of care management and decision-making for new standards of care. AI for screening and high-repetition tasks also has been viewed as a promising area, with numerous start-up vendors focused on augmenting the reading of high-volume areas such as breast and lung imaging. The promise of these new tools will clearly appeal to health providers and payors in the current context of radiologists' dwindling resources and a focus on limiting the cost of care provision. However, the predominantly single-payor, publicly funded European market could be a tough nut to crack, such is the stringent need for long-term clinical validation ahead of more mainstream adoption. Given ECR's international nature, it is also a good time to take stock of how Europe is faring in the adoption of AI for radiology. For a start, there will be a notable lack of homegrown European AI vendors on the show floor at ECR 2019. The EMEA (Europe, the Middle East, and Africa) region is well behind the Americas and Asia Pacific in terms of investment, accounting for only 15% of more than 1 billion euros of global funding for medical imaging AI companies since 2009. Against the criteria of the maturity model (see figure), it is also arguable that Europe is falling behind the leading markets of North America and China in terms of adoption. 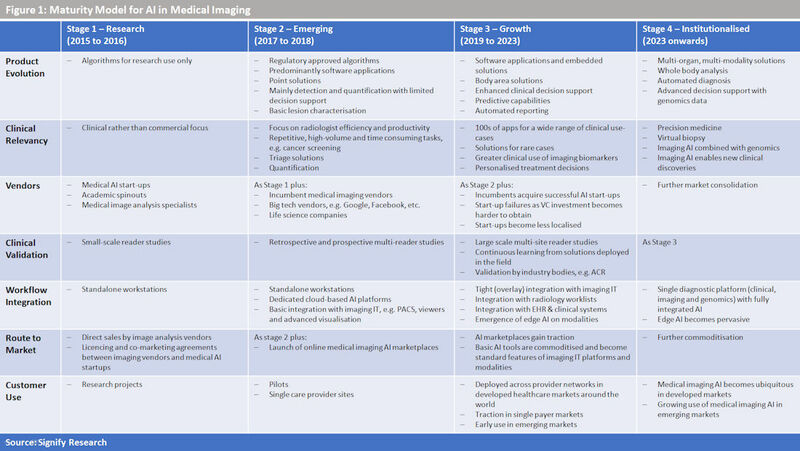 However, Europe retains some promise in terms of AI adoption in medical imaging, especially in research and development. The availability of diverse, longitudinal patient datasets at a regional or even national level offers a unique proposition for training and testing AI tools at scale. Furthermore, European CE Marking regulatory approval is often viewed as a faster route to commercialization as opposed to regulatory bodies in the U.S. and China. Whether Europe can maximize these strengths and catch up with the front runners is bound to be a significant topic for debate this year. Unlike at the RSNA show -- the bigger, brasher American cousin of ECR -- the exhibit floor in Vienna so far has remained stoutly focused on radiology in terms of IT software, mostly ducking the overzealous marketing hype surrounding both vendor-neutral archives (VNAs) and enterprise imaging. Although this may in part reflect monolithic electronic medical record (EMR) adoption being slower in Europe than in North America, the concept of enterprise imaging is far from being overlooked either. In fact, Europe can boast examples of some of the most mature and largest imaging IT networks on the planet, especially in the Nordics, the Netherlands, the U.K., and Spain. These networks, among others, were tasked at conception with connecting radiology departments together, forming the basis of multisite enterprise PACS networks. Yet over time they have been upgraded or have matured to handle imaging from across the wider healthcare provider network, especially in markets where the adoption of EMR has interfered less in clinical and diagnostic departments. The next phase of adoption will be evident in the latest imaging IT platforms on show, with a clear push targeting interoperability for nonstandard imaging. Breast imaging, given its specialist and multimodality focus, has until lately remained an interoperability challenge, but new platforms can handle, manage, and analyze conventional mammography, digital breast tomosynthesis, and breast ultrasound without the need for specialist workstations. Point-of-care ultrasound also had been a head-scratcher, given that it was rarely logged as an "order" within conventional imaging IT workflows, a consequence of its ad hoc use in many clinical settings. Today, several platforms can retrospectively ingest and manage these images and make them available as part of longitudinal clinical records. Dermatology and noninvasive cardiology are other clinical sectors following suit in being embedded into broader enterprise imaging platforms. Some radiologists may have expressed that vendor consolidation will lead to the loss of best-of-breed features, though this has rarely been the case, with a far greater push from vendors on being interoperable with a wider variety of third-party applications. Doubters also should not overlook the opportunity that enterprise imaging creates in supporting multidisciplinary care coordination. Enterprise imaging, in fact, could help to place radiology front and center in the reshaping of European care provision. Arguably the most influential trend affecting every new product that will be on display at ECR 2019 will be very subtle: efficiency. With healthcare spending and resources under increasing pressure and scrutiny, technology vendors have latched onto efficiency as the new gateway to long-term business sustainability. New scanners at ECR 2019 will boast a plethora of efficiency features designed to speed up, simplify, and improve system utilization. Examples include faster scan protocol selection and setup for MRI, improved user interfaces, tablet-based controls, reduced power consumption, and smarter patient positioning in CT, MRI, and x-ray. As discussed, the increasing computational power of new imaging hardware also supports more efficient imaging, such as the varying uses of model-based iterative reconstruction in CT to not only speed up scan times but also reduce patient radiation dose. Structured reporting also will be evident in many reporting solutions shown at ECR 2019, focusing on augmenting the radiologist reading experience. A multitude of workflow and reading tools are being subtly woven into diagnostic software platforms, with examples including the use of natural language processing in reporting, prefilling of reports with quantitative measurements, and adaptive interfaces for reporting. These subtle enhancements focus on the concept of marginal gains in the reporting process; by saving valuable seconds per scan, technology vendors are betting they will have the compound effect of saving larger amounts of valuable radiologist time. Although this in principle should be applauded, it also comes with some risk: Structured reporting adoption often depends in practice on healthcare providers overhauling protocols and establishing new standards. Therefore, vendors will need to temper adoption expectations against the rate at which radiologists and health providers can implement changes, a difficult balance to master. With enterprise imaging gradually maturing and efficiency a clear trend in medical imaging, the use of analytics for operational and practice management at scale will be prominent at ECR 2019. Many health systems are consolidating throughout Europe, and the need will intensify to more efficiently capture and analyze operational data for imaging use and diagnostic reporting. Thus, a new breed of business intelligence and operational modules is emerging that is focused on care quality audit, performance dashboarding, and clinical outcomes. These tools, in some cases driven by AI, will offer providers a further arsenal to better assess, benchmark, and manage their imaging services. These solutions will be especially common from the largest technology vendors that have a wealth of data and experience from their global installed base of imaging hardware and software. In a bid to establish or maintain long-term repeatable business, these vendors will use operational tools to provide a path toward longer-term partnership with healthcare providers, with a foundation of risk-sharing or outcome-based managed service contracting. Although Europe still is only at the start of this transition process, it should be clear at ECR 2019 that the days of large capital expenditures and "rip and replace" for medical imaging technology could be numbered. 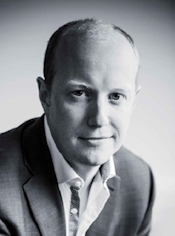 Stephen Holloway is principal analyst and company director at Signify Research, a health tech, market-intelligence firm based in Cranfield, U.K. He can be reached at steve.holloway@signifyresearch.net.